FEATURE: Can Direct Air Capture of Carbon Help Solve Shipping's GHG Problem? Beyond the upcoming IMO 2020 global sulfur cap lies a much bigger challenge for the bunker and shipping industries: IMO's pledge to reduce marine's average carbon intensity by 40% in 2030 and total emissions at least 50% by 2050 compared to 2008 levels, all while working towards phasing out emissions entirely by the end of this century. The International Chamber of Shipping (ICS) and DNV GL are among those who believe that the development and widespread use of commercially available zero CO2 fuels will be needed to achieve this, in addition to a raft of other efficiency measures. If the run up to IMO 2020 is any indication this is likely to be a costly and complex exercise. An option that has received little attention to date is Direct Air Capture (DAC) of carbon. 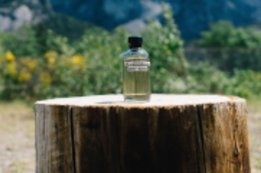 That is, instead of developing and burning zero carbon fuels, the traditional fuels are used, but an equivalent amount of emissions is captured back from the air and stored underground to negate their impact. The fact that carbon capture has received relatively little attention in the marine space is understandable. For one, the cost and technical complexity of large scale capture is something that is generally viewed as prohibitive. Even if it wasn't, it would be quite the challenge to operate traditional, at-source carbon capture units on each of the 60,000 vessels in the global fleet. And that's before we've considered managing, storing, and disposing of the huge amounts of captured carbon that would be produced during every voyage. Direct Air Capture of carbon is a very different proposition. It involves the capture of carbon directly from the air at an arbitrary point on the planet, away from any source of direct CO2 emissions. While this makes it a more complex and costly affair than capturing CO2 at source, it lends itself well to offsetting CO2 emissions from sources such as ships where direct carbon capture is difficult or undesirable. Most consider such technology to be in its infancy and only destined to play some future role in the global emissions reduction effort. But Canada-based Carbon Engineering is a firm focused on developing DAC that this year has already made headlines by revealing it is far closer to being a commercial reality than many give it credit. But is DAC far enough along to play a part in solving shipping's GHG problem? Geoff Holmes, who handles Carbon Engineering's business development, believes it is. "Carbon Engineering was founded with a mission to develop and commercialize technology to remove CO2 from the air on an industrial scale. We have always seen it as a way to manage emissions from diffuse and mobile sources that don't lend themselves to elimination or capture at source, such as from aviation and shipping," says Holmes, who recently discussed his company's technology with Ship & Bunker. "We started just over nine years ago, and in that time we've not only designed and engineered that technology and built up some industrial partnerships that will supply the equipment and help us build facilities, but we've also demonstrated it at a pilot plant in Squamish, BC. So we've proven all the equipment end-to-end and we have a system that captures about one tonne of CO2 per day and purifies it to the point where it can either be stored underground or used for other things." So having established DAC is technically viable, next comes the questions of cost and scalability. In terms of cost, Holmes' headline figure is a total cost of $100-$150 per tonne of CO2 captured for a plant operating over a 25 year lifecycle. That includes all costs associated with constructing and maintaining the facility during that period. Given that roughly three tonnes of CO2 is produced per one tonne of bunkers burned, that would mean a premium of $300-$450/mt on current bunker costs to make them carbon-neutral using Carbon Engineering's DAC technology. "We've always known we can capture CO2 from the air because we do it on spaceships and submarines. The question is at what cost can we do it on an industrial scale and can we compete to have a useful place alongside all the other options to reduce emissions and address climate change? We think the answer is yes," he says. 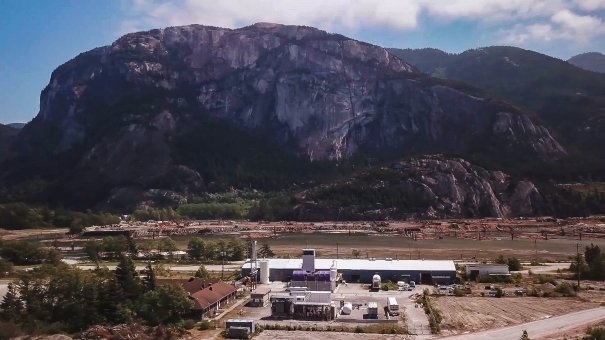 The Squamish pilot plant, located about 30 minutes north of the Port of Vancouver, is capturing one tonne of CO2 per day. Carbon Engineering is aiming for its commercial plants to capture one million tonnes per year of CO2 at that sam $100-$150 per tonne price point, and Holmes is confident his company's technology will scale to that. For context, a fleet of 25 medium sized vessels burning 50 mt/day of bunkers with 250 sailing days per year produces about 937,500 tonnes of CO2. "We think this scales up quite well. That's been our goal and strategy from the get go in that we've wanted to design a Direct Air Capture technology that lends itself to being built and having advantage economically at very large industrial scale," he says. "In fact we built an air capture technology that's quite hard to deploy at smaller pilot scale because there are a couple of thermal steps in the process that are harder to do when they're small than when they're big." The DAC process itself borrows equipment and chemical processing techniques from a variety of different industries, Holmes explains. "The air scrubber, for instance, borrows loosely off of cooling tower design philosophies and the air scrubber at our pilot facility is built by a cooling tower company. There's a module in the middle of our system that borrows from waste water treatment." "So we've designed the pilot scale equipment with those related companies so the data is representative, and when we need to engineer a unit at commercial scale, we can use our data and known techniques to do that. As such, we're confident this scales to mega-tonne sizes and we can control the costs and performance." A commercial plant of the one million tonne/year scale would take two to three years to build, he adds. Capturing CO2 is only part of the DAC proposition of offsetting CO2 emissions. "One thing we can do instead of injecting the captured CO2 underground is we can inject it into oil reservoirs. Through this enhanced oil recovery we can make bunker fuels that, on a life cycle basis, have a much lower environmental footprint than conventional ones," says Holmes. A third way to reduce the GHG footprint is a technology Carbon Engineering calls the "Air To Fuels" process. This, Holmes explains, involves taking the CO2 captured from the atmosphere along with hydrogen produced by the electrolysis of water, and combines them to make drop-in synthetic fuels. "We can do this using renewable electricity that's become very, very cheap and isn't good at electrifying large ships, and instead use that to produce the kind of hydrocarbon fuels that today's engines want, without the use of fossil energy input and thus without fossil fuel emissions to the atmosphere," he says. "In a happy coincidence, we can do so without any sulfur content in those fuels as well. So we improve the GHG and the PM and SOx footprints. And while we have actually made both diesel and jet fuels, particularly for marine it may be that we're better off making low-sulfur feedstocks to put into the mix in a refinery." An important consideration for carbon capture is environmental equivalence; that is, is capturing carbon the same as not producing it in the first place? "I think it's fair to say it is," says Holmes. "There will be a different impact in local air quality where the fuels are being burned but from a lifecycle GHG perspective it is the same as never having used it in the first place." The physical GHG offsetting is also verifiable, he adds. There is also the question of political acceptance for such a solution to the IMO's GHG targets. Would such a scheme be embraced or viewed as "cheating" in the same way some view scrubbers for IMO 2020 compliance? If ICS is any indicator, carbon capture could be viable. "In the long term, nothing is ruled in out, but carbon capture is still a somewhat embryonic/unproven technology especially for use on board commercial ships, which is why our current assumption is that the IMO target for a total 50% cut of shipping emissions by 2050 - seen in the context of projections for increases in maritime trade - is most likely to be met with the development of zero CO2 fuels," Simon Bennett, Deputy Secretary General, ICS, told Ship & Bunker. "From a political perspective, carbon capture presents no difficulties for us, and would of course enjoy support from those IMO member states that produce large quantities of fossil fuels, but we have yet to see evidence that this a viable technical solution, although we are ready to change course should the contrary be demonstrated." DAC is not without its drawbacks. Operating such a facility requires energy, and while a plant in Squamish may have access to ample clean energy, this is obviously not the case everywhere. Capturing carbon from the air is also less efficient and more costly than capturing it at an emissions source. Not producing the emissions in the first place is even better. So looking at the wider COP21 goal of reducing GHG emissions and addressing climate change, carbon capture - direct or otherwise - is clearly not the answer for a large proportion of energy use-cases. But looking at the options currently on the table for Shipping and the available time to act, marine is arguably one of the of areas where DAC could make a difference. Can DAC Fit Into Shipping's IMO's 2030 and 2050 GHG Plans? Replacing some 300 million mt/year of high energy density liquid fuel with a cost-effective alternative is not an easy task. A greater problem is that the big burners of the global fleet may be few in number but they account for large proportion of fuel consumed and emissions produced - by BP's numbers, just 6% of the global fleet burn 30% of the fuel. Replacing the energy needs of these vessels with zero-carbon alternatives is a significant challenge. There is no doubt battery technology is advancing at significant pace and there are already a growing number of battery-powered vessels plying the waters. Using renewable energy directly to power these vessels instead of capturing their carbon is clearly more efficient and better all round from an environmental perspective. But those are smaller vessels and if a battery-powered 20,000+ TEU box ship is ever realized that will be a considerable way off into the future. Of course some argue that if you add wind, solar, biodiesel, and ammonia into the mix then the global fleet can get to zero GHG emissions. And while it will take time to fully develop and implement these solutions, and more importantly, prove them in the commercial world for safe vessel operation, the IMO 2050 GHG target is relatively far away. As the average age of a vessel is around 20 years it is also likely the majority of today's fleet will have been replaced by then, easing the path to adoption of such new technologies. But there are targets such as IMO 2030 that are much closer and achieving them will almost certainly involve a significant proportion of today's existing tonnage playing their part. Having a solution like DAC that can address these GHG emissions reduction goals using today's unmodified tonnage has an obvious attraction. This is especially so if this can be achieved for a premium of $300-$450/mt on current bunker fuels. The industry is already preparing to face a cost of this magnitude just to comply with IMO 2020 sulfur regs. And a shift towards closed-loop units. Facilities to be built at either Santander or Bilbao. 3,229 vessels have either ordered or been installed with scrubbers.